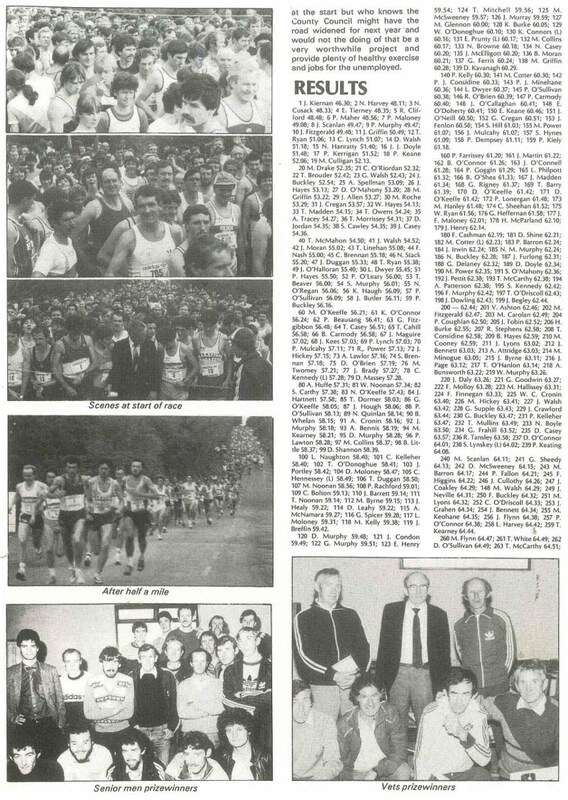 North Cork AC as a club was first established in 1981 and over the years have hosted a number of top class races from the Dromina 10 in the early 80’s to the Charleville 10km and Charleville 10 mile Road Race in the 1990’s. The current race, the “Charleville International Half-Marathon” was inspired by these races and this years 2012 race in particular echo’s the Dromina 10 mile road race which took place back in 1984. The year 1984 also happened to be an Olympic year. 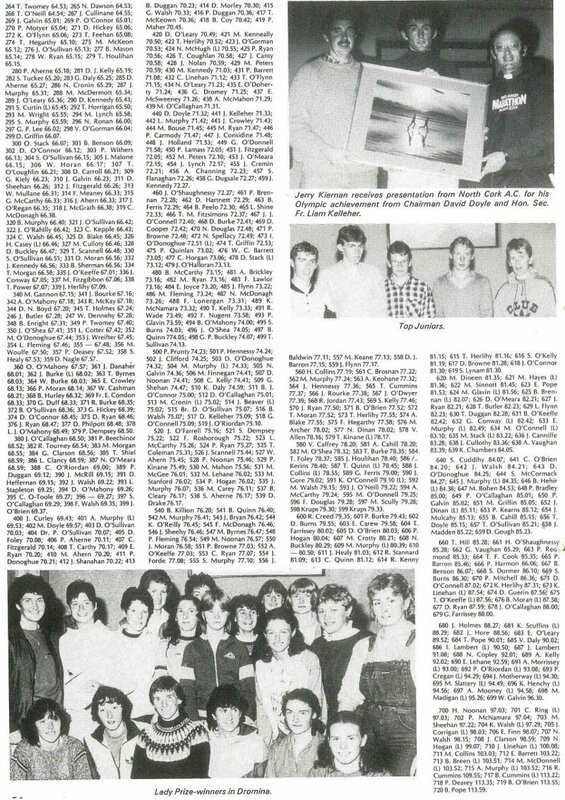 Here, below is an article taken from “Marathon Magazine” which was owned and edited by the then coach of North Cork AC, Fr. Liam Kelleher who was a coach to a number of Irish Olympians in the 1980’s and 1990’s. Fr. Kelleher was the organiser of the Dromina 10 at the time. The Dromina 10 mile road race in North Cork started in 1982 just as the running boom of the 80’s was beginning. It lasted for 5 years with the final race in 1986. At the time, it was one of the largest races and attracted some of the best runners in Ireland (See Results below). 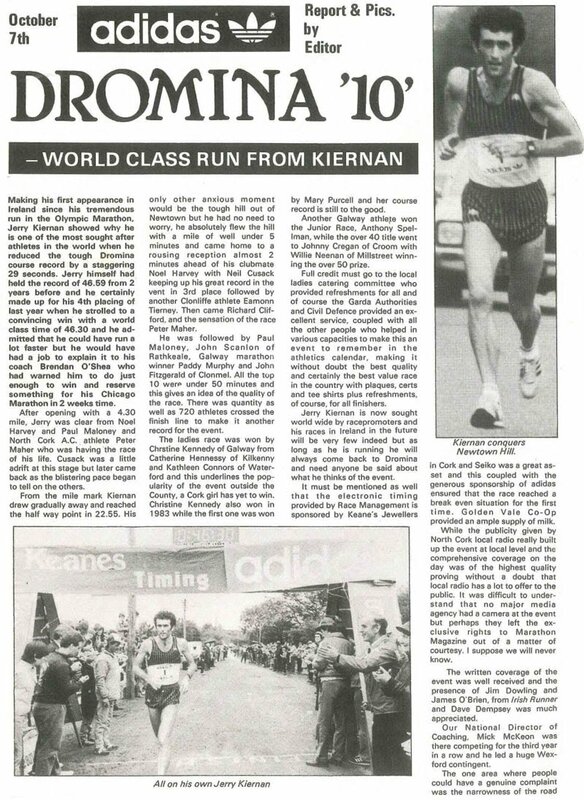 1984 was possibly the best year of the Dromina 10 when Jerry Kiernan won the race in 46.30, just a short time after finishing 9th in the Marathon at the 1984 Los Angeles Olympics and a couple of weeks before running a high class time in the Chicago Marathon. In that year, there were 720 finishers with 126 beating the hour mark with 9 runners running faster than 50 minutes. Compare that to the 2011 Ballycotton ’10’ with 2,384 runners and 107 beating the hour. Only one Irish runner broke 50 minutes that year, Alan O’Shea running 49:58 in 2nd place behind Moldovan native Sergiu Ciobanu 49:36 from Cahir in Co. Tipperary, who won the race from Alan in the final miles. However it is unfair to compare performances of different era’s due to the fact that the performances occur in very different societies with very different economic and social pressures on the athletes of that time. A more pertinent comparison which could be made, is to compare one race to another in Ireland in the current era. This may be a much more enlightening activity. The Dublin Half-Marathon which is the biggest Half-Marathon in the country in 2012 had over 6300 finishers. Dublin had 1 male finisher faster than 70 minutes who was in turn disqualified due to him being unable to reach the start line. Charleville had 7 male finishers under the 70 minute mark with the top 2 finishers getting under 66 minutes. Dublin had 3 females under 80 minutes while Charleville had 4 females go sub-80. The winning female time in Charleville was over 5 minutes faster than the winning female time in Dublin. Dublin had 59 finishers under 80 minutes while Charleville had 49 finishers under the 80 minute mark. What conclusions can be made from these statistics? If a small club like North Cork AC with only a handful of senior members can provide a top-class race like this for Irish runners in order to help them to get the best out of themselves then why can’t a race like the Dublin Half-Marathon do the same? …and for that matter, why do other large races who obviously gain a significant amount of income not re-invest in the sport to help Irish runners perform at this level? Surely it is a responsibility of every athletic event to provide opportunities for Irish runners to perform at their best, especially runners who have dedicated their lives and sacrificed so much in the noble pursuit of their athletic careers? In 2013 the Dublin Half-Marathon will take the form of the Rock’n’Roll Dublin Half-Marathon which no doubt is aimed at boosting the image of the sport to the masses and the general public. However with the resultant increase in revenue from entries and sponsorship, will there be a an equal/proportional increase in the resources devoted to facilitating Irish runners perform to a high level? Or…will it always be left up to small clubs like North Cork AC, who have a passion for athletics and distance running to provide the kind of assistance to athletes that they need in order to perform at a higher level than they would otherwise if not facilitated? It is our conclusion that it will only be possible for top Irish distance runners to increase their performance standards through the organisation of proper competitive races on fast courses where the race organisers actively assist and facilitate these performances. We believe it to be a responsibility of a race which is gaining so much from the sport financially to give back to the sport in this way. We believe it immoral for a race not to give back in this way since athletics main purpose has always been to facilitate ALL runners to compete to as a high a level as their talent allows them to. Our top runners can only perform at a high level, especially in current society where there are high living standards, when they are rewarded for the sacrifices they make. The sacrifices made in the current society of high living standards are much more difficult to make compared to the society of the 1980’s when our distance runners performed to a high level. It is not that our athletes are not willing to make the sacrifices or train as hard but it is just more difficult to make the proportionally larger sacrifices relative to those that were made in the 1980’s. Role for AAI and Marathon Mission? Perhaps the AAI and the Marathon Mission initiative could take action to ensure that more races like Charleville are provided for Irish distance runners and that there is an onus put on the race organisers of the big half-marathons such as Dublin, Longford and Waterford to facilitate the top runners. If these races do not provide these opportunities while making large profits from these events, then races who do try to provide these opportunities will not thrive or continue in the long term. There is a responsibility of all runners to support races that facilitate top Irish distance runners and possibly actively not support races who are obviously ignoring their responsibility to the Irish distance running movement. If we don’t have Irish Distance runners being facilitated to perform at a high level on a regular basis, then we won’t have athletes to inspire the next generation of Distance Runners to come through from the juvenile ranks. There will be no real incentive of real substance to inspire them. We would suggest that any race of 10miles or over, with over 750 entrants be required, as a condition of their AAI Permit to devote a minimum of 25% of their PROFITS to a properly graduated prize structure for the athletes in their race. Failure to provide a prize structure of this standard should result in a refusal by AAI to grant any further permits to the organisation or club organising this race as long as this race continues to refuse to provide an adequate prize structure. The sport of athletics and especially distance running has been built on the backs of thousands of volunteers over many years. Many of these volunteers worked to build the sport so that athletes would be given the opportunity to pursue their sport to as high a level as their talent would allow them. Now that distance running has become so popular through the efforts and work of these volunteers, their ideals should not be thrown aside. The ideals of allowing Irish athletes to pursue their athletic talents to as high a level as possible should be promoted wherever possible in Irish athletics events. Irish athletes and especially distance runners who have to compete against top distance runners internationally need to be supported so that they can continue to develop their talent to fulfill their true potential. Perhaps if the example set by North Cork AC in organising the Charleville International Half-Marathon is followed by other race organisers, then we can expect to see an increase in the standards of performance. Otherwise we may see the demise of the sport into a very uninspiring format where athletes pursuing noble athletic achievement is no longer celebrated or supported. The kinds of performances and depth of performances witnessed at the 1984 Dromina 10 and at other races of that era can and will only be repeated …and improved upon, through the proactive support of everyone in the sport of athletics and distance running. Allowing the current malaise in road racing in Ireland to continue is simply not an option if Irish Distance Runners are to be competitive internationally again and if we want Irish children to be inspired by athletic role models from Distance running in Ireland. Everyone has a role to play in this movement to better the sport overall through supporting races which reinvest in the sport of athletics and distance running through good prize structures and good quality organisation standards as could be seen in Charleville in 2012. If you have a choice between a race which reinvests in the sport or a race which does nothing for athletics except organises an event for the sake of participation, which are you going to choose?? The above statistics and opinions are expressed by Charleville International Half-Marathon race organiser Michael Herlihy. Michael has been in the sport of athletics for over 21 years and has achieved a reasonably high level of performance in road running with a personal best over 10 miles of 50:57 (Mallow 2009) and Half-Marathon 68:21 (Bantry 2009) Michael also has a degree in Sports & Exercise Sciences and is currently completing a Masters in Sports Performance at the University of Limerick. Michael returned from Australia after working at the Australian Institute of Sport for 3 years between 2004 and 2008. There he learned a significant amount about high performance sport and all the elements which are required to help athletes perform at a high level. Through working with coaches of Olympic medal winning athletes and high level sports managers at the AIS it became obvious to him that by simply doing all the basic things in sport right and nurturing athletes in the right way, they could flourish to become world class performers. There are no real secrets but rather the formula for success is very simple. He returned to Ireland to see where he could influence change for the better for Irish athletes with his knowledge of high performance sport. The Charleville International Half-Marathon is one way which he has been able to demonstrate what can be done for Irish athletes. He is hoping that he will get support for this and more initiatives in the future to help Irish athletes pursue their goals. However his initiatives will only be successful through the full support of the athletics community. 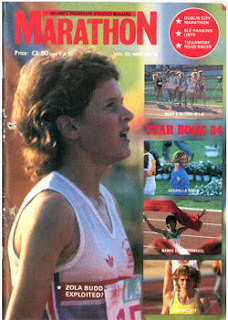 Michael in his younger years as a juvenile athlete received a lot of his inspiration from articles written about top Irish distance runners in the Marathon magazine. Fr. Liam Kelleher always provided comprehensive interviews with and articles about Irish athletes to inspire the younger generation of juvenile athletes in Ireland. He identified the link between this kind of inspiration that senior athletes could provide to the younger generation of juvenile athletes, not just to inspire them to high levels of performance but to keep them in the sport for the long term, perhaps even as a healthy life long activity. This link is crucial in ensuring the long term health of the sport overall as well as ensuring distance runners from Ireland can achieve success internationally for their country.